Secrets of mass variation; texting with graphene; tunneling in 2D. The General Conference on Weights and Measures will soon approve a plan to redefine the kilogram and other measurement units. The new definition for the kilogram will be based on the fixed numerical values of Planck’s constant (h). Supposedly, the new definition will solve the current problem. The kilogram is the only SI unit that is still described as an artifact rather than a fundamental physical property. The redefinition won’t solve the entire problem, however. “Even after redefinition, as a practical matter, mass will continue to be disseminated in the form of artifacts which will be susceptible to environmental effects such as adsorption or desorption of gases,” according to the National Institute of Standards and Technology (NIST). To solve that problem, NIST is testing a new and experimental apparatus, which will have about twice the sensitivity of a quartz crystal microbalance (QCM). The new apparatus will measure how various material surfaces gain or lose mass in different environments. It will have a sensitivity of 0.02 nanograms per square centimeter. The new tool makes use of an oscillator. The oscillator is fabricated from a thin silicon crystal. It is cut, forming two paddle-shaped sections connected by a central axis. This double-paddle oscillator (DPO) has several vibrational modes. The text was carried on a 4.3-GHz signal without any distortion. The demonstrated performance is 10,000 times better than previously reported efforts for graphene integrated circuits, according to IBM. The multi-stage graphene RF receiver consists of three graphene transistors, four inductors, two capacitors and two resistors. All circuit components are fully integrated into a 0.6mm2 area and fabricated in a 200mm fab. “This is the first time that someone has shown graphene devices and circuits to perform modern wireless communication functions comparable to silicon technology,” said Supratik Guha, director of physical sciences at IBM Research. Graphene consists of a single layer of carbon atoms packed in a honeycomb structure. It possesses good electrical properties, but the technology does not have a band gap. Fabrication of a true integrated circuit is also challenging because the atomic dimensions of a sheet of graphene can be damaged during the fabrication flow. 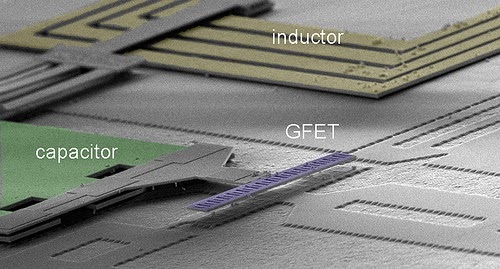 IBM’s new graphene fabrication approach reverses the conventional silicon integrated circuit fabrication flow. It leaves graphene transistors as the last step of the flow, which preserves device performance. At the recent International Electron Devices Meeting (IEDM) in Washington, D.C., IBM described the process flow in a paper. “Inductors and bottom plate of capacitors were first fabricated at M1 level. M2 level served as top plate of capacitors as well as the bottom part of the embedded T-gate. M3 metal lines were then patterned to form the top part of the T-gate, where the width of M3 lines defined the transistor’s Lgate,” according to the paper. The U.S. Naval Research Laboratory (NRL) has put a new spin on graphene. Researchers have developed a homoepitaxial tunnel device structure in which the tunnel barrier and transport channel are made of graphene. The urgent need for lower power devices has rekindled the interest in tunneling, where electrons move through a potential barrier rather than going over it. Tunneling is a key for an emerging technology called tunnel field-effect transistors (TFETs). In bulk form, 2D materials like graphene and hexagonal boron nitride exhibit strong atomic bonding. But they also exhibit weak bonding between the layers and do not intermix readily with other materials, according to researchers. Researchers from NRL have shown that fluorinated graphene can act as a tunnel barrier on another layer of graphene for charge and spin transport. In the lab, researchers fluorinated the top layer of a graphene bilayer and decoupled it from the bottom layer. The material, in turn, serves as a single-monolayer tunnel barrier for both charge and spin injection into the lower graphene channel. They deposit ohmic gold and ferromagnetic permalloy red contacts, which forms a non-local spin valve structure. When applying a bias current, a spin-polarized charge current tunnels from the permalloy into the graphene transport channel. This, in turn, generates a pure spin current that diffuses to the right. This spin current is detected as a voltage on the right permalloy contact that is proportional to the degree of spin polarization and its orientation.